November 2017 – Teach. Brian. Teach. For 1D impulse and momentum, we need a more integrated representational set than what Knight’s textbook gives us. They do before and after (sort of vector) diagrams and force vs time graphs for “during”. I’m not quite ready to stray really far from what Knight supports (since I like the class to be coherent across class and text); so, although I like IF momentum charts (from modeling), I’m thinking more of cycling back to velocity vs. time graphs more strongly and adding momentum vs. time graphs. In 2nd semester physics we started solving circuit problems. Here is one group’s whiteboard. I’ve been leaning toward having students make a new graph and new table for each reduction. In general this mix of representation helps students to make sense of what they are doing with out over reliance on equations. And solving the problem sort of feels like working on a sudoku puzzle. Before doing circuits we did a review activity to help us retrieve information in our minds, seek our relationships, notice gaps in our understanding, and ask questions. With all new concepts, a lot of students were confusing units with algebraic symbols. We also needed to talk about difference between general cases vs point charge specific cases. Students had lots of good questions about cause of charge, electric field, and electric potential energy. We clarified a lot about connection between potential and potential energy. In physics one we finished up our introduction to energy and cycled back to kinematics to examine free fall. I like holding off on freefall until after students have forces, impulse, and energy under their belts. 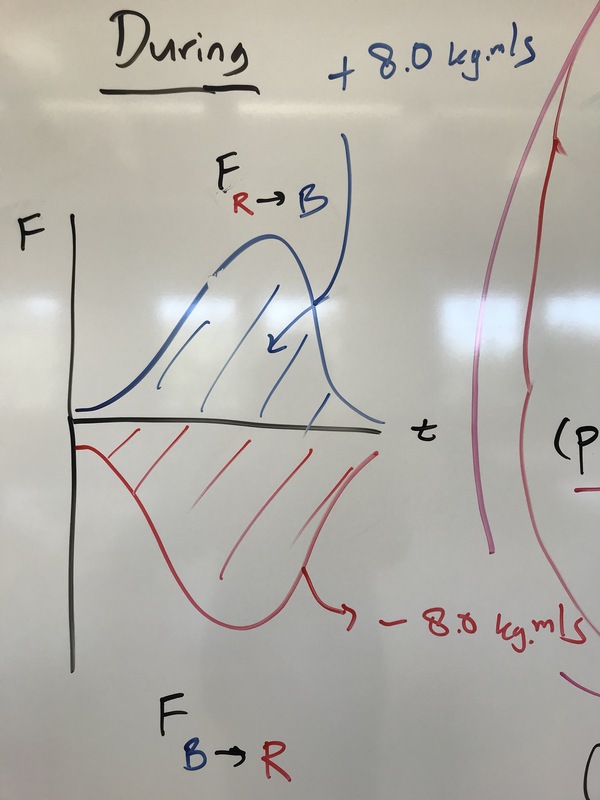 Students can make sense of what we do and don’t mean by free fall, can productively grapple with why acceleration is same for all masses, and have better hooks for what we do and don’t mean by initial and final velocity. 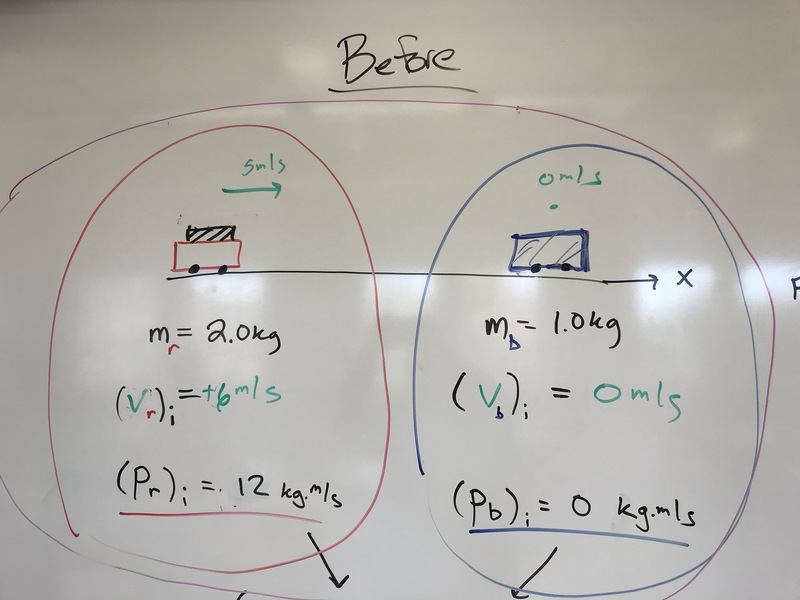 Here is some data we collected for a bouncy ball, using a Vernier motion detector to calculate kinetic and potential energies. Next year I’d like to design a coherent lesson around these graphs. So many cool things to notice and ask questions about. I have become pretty emotionally sensitive to instructor dialogue that is explicitly geared toward bashing students, whether it be about a specific student or students in general. It sort of feels like I’m being attacked when I’m around this kind of talk, and my body prepares for “fight or flight”. While I do think it’s important to call out student bashing, the emotional state I get into often drives me into an unproductive attack mode. Instead of drawing attention to the behavior, I respond by attacking the person before me, usually by redirecting the attack toward something they hold dear. (1) be more explicit about calling out of student bashing behavior when it is done in a casual manner or in a vicious / callous manner. I think in these cases directly calling it out is a decent option. I should try to remain calm but firm, while trying not to sound holier than thou. Maybe an impossible balance, but I have and probably will engage in some form of student bashing, so I need to learn to callout the behavior, not the person. (2) on the flip side, be more accepting of the big feelings that can behind student bashing. These can include feelings of powerlessness, vulnerability, despair, resignation, self-loathing, and culpability as much as they can also be about frustration, anger, indignation, and resentment. I’d like to be better at redirecting the student bashing toward a recognition and acceptance of those feelings, rather than my normal response which is to redirect the bashing toward another victim. Student bashing can, I think, be a cry out for sympathy or assurance. I can be a better colleague by responding with sympathy and assurance about these feelings without sympathizing with nor assuring the student bashing. Curriculum development has moved me in a direction of teaching momentum in following order. Investigating impulsive forces–factors that effect peak force and duration. We us force sensors and change factors like mass, speed, bumper stiffness in collisions with a wall. We then introduce and practice with impulse and change in momentum, both with sensors and logger pro and by hand. Clicker questions, ranking tasks, and a problem to determine the impulse and peak force of a baseball bat on a base ball. Investigating elastic collisions comes first. Doing this helps conceptualize the process as momentum transfer. We start with equal masses. All the momentum is transferred. We then look at cases where some but not all of the momentum is transferred, and finally when more momentum is transferred than one had to begin with. After observing and discussing qualitatively, we get quantitative, but I don’t have students predict anything. We observe and analyze it in terms of momentum, for the purpose of determining how much momentum was transferred. We draw before during after diagrams. At end, we see that the momentum of each system is constant, and I introduce concept of an isolated system We look at explosions next as another example of isolated systems that starts with zero momentum. Students analyze mock explosion data and sort them into possible and impossble explosions. A little bit of neutrino history gets sprinkled in here. 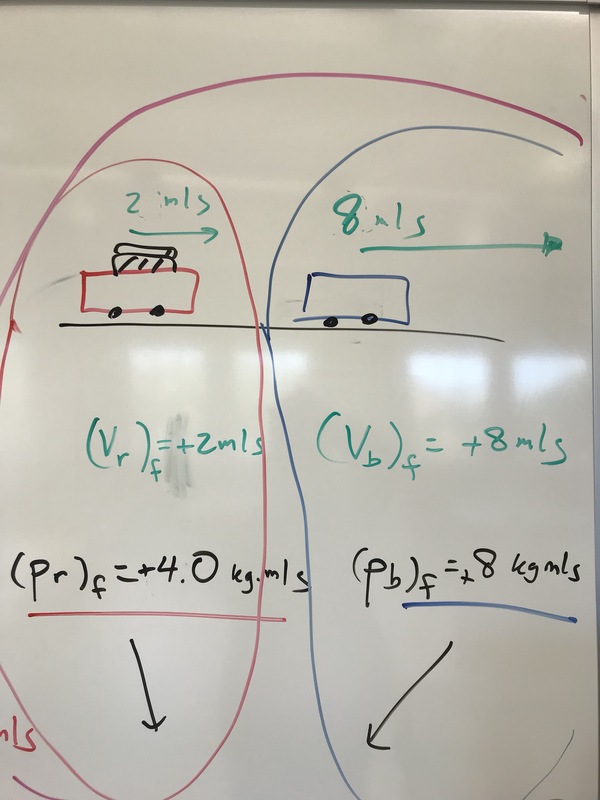 Finally we look at Inelastic collisions, and this is the first time students use momentum conservation to make predictions. Studnets predict final velocity, but then must also determine how much momentum was transferred. Doing so involved practice shifting perspective, from system to individual objects. Many times people start with Inelastic collisions, but I think that’s a mistake. While you can calculate easily, it obscures transfer. Elastic better promotes transfer idea I think.